Northampton Town are set to sign Darlington striker Tadhg Purcell after he agreed terms on a two-year deal. The 25-year-old rejected a contract offer to stay at the Quakers, and he is due to undergo a medical before joining the Cobblers next week. "There was a lot of interest in Tadhg," boss Ian Sampson told the club website. "He performed very well last season and to score nine times for a struggling side in less than half a season shows the potential he has." A midfield of Davis, Osman, Thornton and a new right winger would be excellent service for him. I can see him being a top striker in this league. 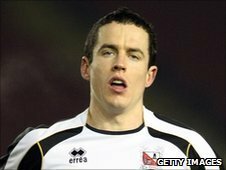 Purcell rose through the ranks in Irish football, playing for Kilkenny City and Shamrock Rovers before joining Darlington in January 2010. "We have had to be patient to get our man, but we have beaten off a lot of competition to land him," said Sampson. "He played well against us and when we knew he was a free agent this summer, we were keen to bring him in. "He is a good finisher, has a lot of physical strength and understands the game."